Tesla (TSLA - Get Report) has fallen about 10% so far in 2019, even as the company has pushed its way into the top ranks of U.S. car sellers. TSLA lost 3.2% to close at $300.36 on Thursday, one day after shedding 6.8% in 2019's first trading day. All told, the stock is down some 10% since closing 2018 at $332.80. Shares have come under pressure after some metrics came in a tad on the light side when Tesla released its quarterly production and delivery results earlier this week. Bears huffed about the company having a few thousand Model 3s in inventory during 2018's last few days, and got an even tastier snack when the company slashed its prices. Right after the start of the new year, Tesla cut the Model S, X and 3 by $2,000 apiece. But should the markets be so pessimistic? Tesla timed the price cut to coincide with the federal tax credit for electric vehicles dropping from $7,500 to $3,750 per Tesla vehicle. Some argue that Tesla can't keep demand elevated without the tax credit. However, bulls argue that Tesla's increased manufacturing ability has buoyed cash flow and improved margins enough so that it can justify cutting prices to keep grabbing market share. Improving production has done more than boost cash flow though, as it's made the Model 3 one of the best-selling sedans in the country. Tesla produced 61,394 Model 3 sedans in the fourth quarter, roughly a 15% increase from the third quarter. Tesla delivered 63,150 Model 3s for the quarter and 145,846 for the year. Some may say that's not too bad. But it's better than that, it's good enough to land Tesla in the top five for sedan sales for the quarter and make it the best-selling car from a U.S.-based automaker in the quarter. In the quarter, the Model 3 follows the Toyota (TM - Get Report) Camry, Honda Accord, Honda Civic and Toyota Corolla. For supposedly being a niche player with a limited customer base, putting up these kinds of numbers is pretty impressive. For the year, Tesla sold roughly 140,000 Model 3s. While we're still waiting for a few more numbers to roll in for the month from other automakers, we already know the Model 3 will trail the four vehicles above, plus the Nissan Sentra and Altima, Hyundai Elantra and Ford (F - Get Report) Fusion. However, The Model 3 was able to hurdle the Chevy Malibu and Cruze, two sedans from General Motors (GM - Get Report) . That puts the Model 3 in the top 10 for U.S. sedan sales for the year, landing at No. 9. For a company that wasn't supposed to even be around at this point, Tesla cracking the top 10 in sedan sales despite a sedan market that's under extreme pressure is pretty impressive. Further, Tesla didn't meaningfuly increase Model 3 production until May 2018. Tesla has plans to soon start shipping the Model 3 to Europe to the tune of 3,000 vehicles a month, and China, notwithstanding current difficulties, is becoming a more viable option as well, perhaps the ceiling is a lot higher for the Model 3 than many doubters originally thought. 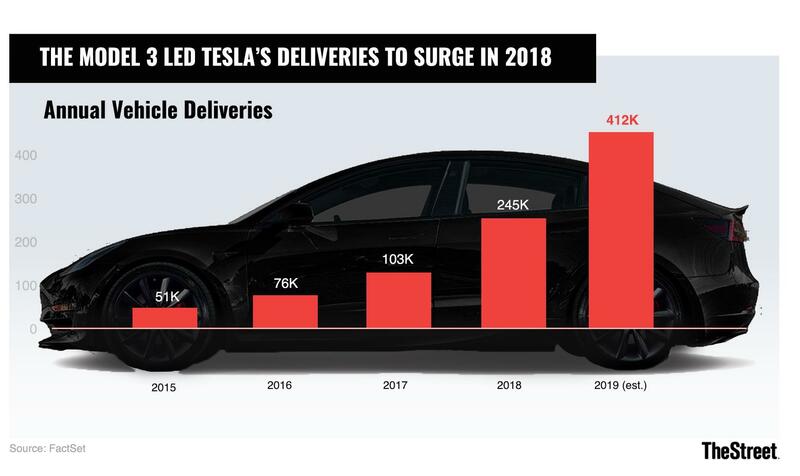 While Tesla still has a long and winding road to go before it's completely out of the woods, 2018 was a pretty good start.